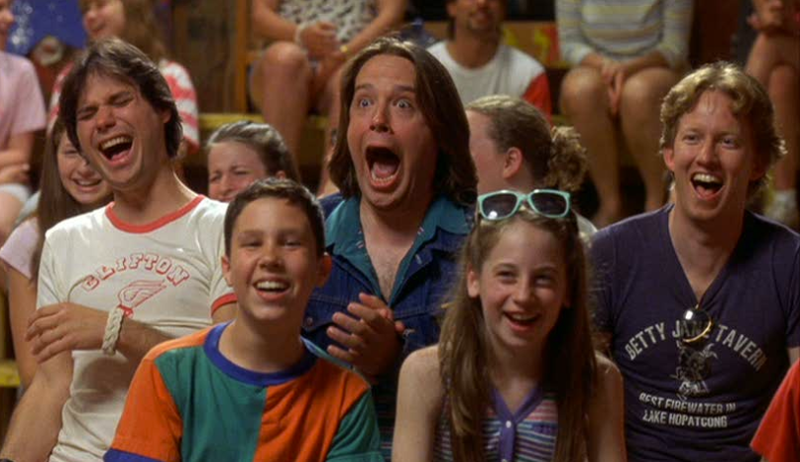 How excited were you when the makers of Wet Hot American Summer announced that they would be releasing a season-long prequel, adapted for television and available streaming in its entirety this summer? Were you this excited? I was jumping for joy. When you have watched Wet Hot American Summer as many times as I have, after nearly fifteen years you really don’t expect a sequel on the horizon. And then it hits you, just like an ice cream headache in the middle of July. And yes, ice cream is quite delicious, but sadly, you can have too much of a good thing. So, my friends, if you have not yet watched the whole season as I have, I urge you to savor it. Savor it as you would a delicious sorbet. Because when it’s gone it’s gone, and this time I don’t think we can expect another installment fifteen years down the line. I paradoxically feel proud and ashamed that I consumed the entire season of Wet Hot American Summer: First Day of Camp in one sitting on the Sunday after its release. Netflix has its evil way of sinking its claws right through you and into your lazy couch on your day off, taking the grunt work out of even pressing play for the next episode. I just let it play through, delighting in the familiar faces, fifteen years later, as they danced across the screen. I was ecstatic to see new, but similarly joy-producing cameos such as H Jon Benjamin, Jon Hamm, Jason Schwartzman, and Michaela Watkins as well. But now I just feel empty inside. I had too much of a good thing, and it just left me craving more. How elated I was, then, this evening when we discovered Hurricane of Fun: The Making of Wet Hot (2015) on Netflix this evening! This casual, behind-the-scenes look at the filming of the original movie was almost as delightful as the four hours I dedicated to the series last week. While I wish I could say that the show came as close to the movie as I would have hoped, this candid documentary of the original movie hit the nostalgia spot a little bit better. Everyone looks so fresh and young and little, and their sense of humor that carries off screen is so warm and relatable. What I wouldn’t give to have been able to join the cast at their own Camp Firewood retreat as they filmed the movie back in 2000. I nearly shed a tear when Amy Poehler dances around one of their camp cabins during filming, lip synching to Le Tigre’s Deceptacon. Why can’t we just be friends in real life already? ?